If you would draw a card while your library has no cards in it, you win the game instead. He’s not exactly expensive to drop, he’s only 2U. 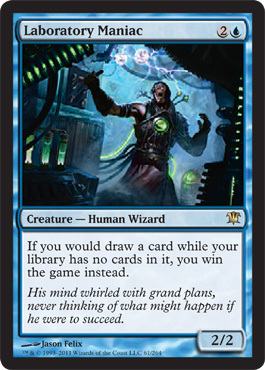 He is a 2/2 though, so it wouldn’t be surprising to go to win and get dismembered before you win the game and lose; it’s a hilarious win-condition, but I feel that disruption could catch up with him too fast. Blue gets some ramp! Deranged Assistant for 1U gives you a 1/1 that can tap to mill yourself 1 and add 1 to your mana pool. Not as good as birds, which adds 1 of anyway, but one mana is always helpful. As a common, he isn’t bad. Avacyn’s Pilgrim is basically a 1/1 green Plains. He gives us 1 white for his tap, and costs 1 green to play. I was hoping when they made something like this, he’d provide either green or white, not just white, but still, not a bad common. 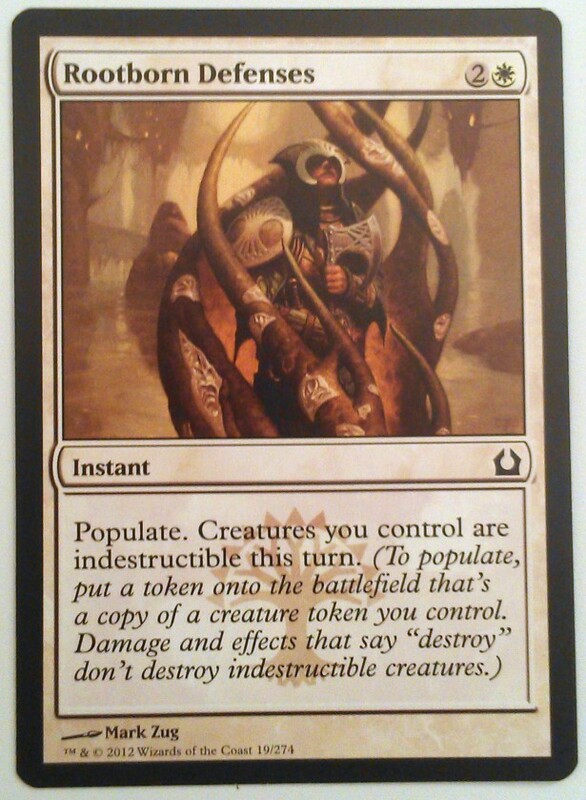 As Mark Rosewater already told everyone, Garruk Relentless, as we saw on the stand-in transformation card, is a double-faced Planeswalker, and is the planeswalker with 5 loyalty abilities. No one’s quite sure what he is or what he’ll be doing in Innistrad. It’s possible he’ll be a werewolf and help the werewolves to transform and transform himself into a werewolf planeswalker, maybe giving us a green werewolf Garruk, similar to Gideon’s zero ability to make himself a 6/6 soldier? It’s all speculation at the moment. Travel Preparations is a Common from Innistrad, and is part of the reason some people are assuming that this will be another three color format like Shards Block. For 1G, you put a +1/+1 counter on each of up to two target creatures. A little awkward wording, but it means you can put one +1/+1 counter on up to two creatures, specifically worded so you don’t have to put two counters on two target creatures, meaning you can use it if you only have one guy instead of giving your opponent a +1/+1 counter. Also, this will see play if Illusions get more cards in this set, as you can pump one of your guys and blow up an illusion as long as they don’t have Lord of the Unreal on the board. The best part is that it has a flashback, which is only 1W; much cheaper than the other flashback costs we’ve seen so far in the set. 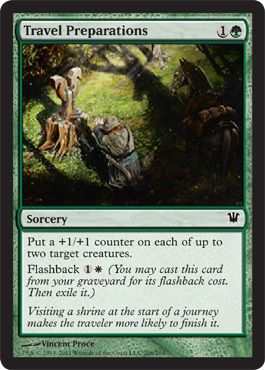 Having flashback means you can potentially spend 4 mana to pump 2 creatures by +2/+2; seems cost effective to me. The main reason people are assuming 3 color decks are coming back is the fact that NayaPod and BantPod (decks that utilize Birthing Pod) are seeing significant play at FNMs and may see further play as we go into the new format, Cawblade no longer in format without Squadron Hawk. As we’ve seen so far, the set promotes multiple colors, but doesn’t have much for multicolored cards so far (aside from Olivia Voldaren), so the rest of the set will tell. Land Ho! Hinterland Harbor Revealed! 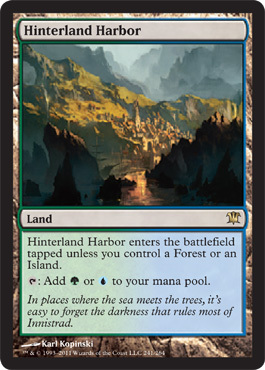 The 3rd of the enemy dual lands to be revealed, Hinterland Harbor is our G/U dual land from Innistrad. 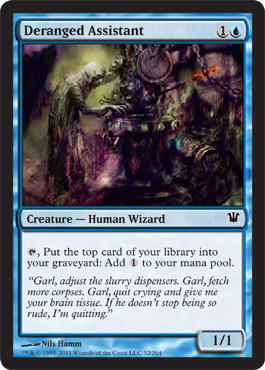 2 life and a mana to pump out a creature whose converted mana cost is the sacrificed creature’s converted mana cost +1. Just… wow. Birthing Pod didn’t see much play when Jace and Stoneforge were running around ruining the format, but now with a bit more creativity in the format (alright, so Cawblade is still winning a large percentage of the format) Birthing Pod is seeing play, and a bit of success, at least at FNM’s and Local tournaments. 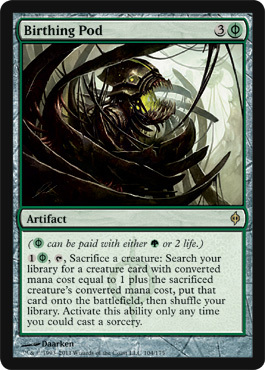 However, this -is- Commanding Opinion, and I have to say, it’s a damn good card in Commander as well, albeit one copy being difficult to hit in a 99 card deck. Voltaic Key lets you pod twice in both Commander and Legacy (but I have a feeling you won’t play Pod in Legacy), letting your Birds of Paradise horrifically mutate into a Blade Splicer or whatever CMC 3 card fits your fancy. All in all, I believe that Birthing Pod is a great card, and I think it’ll see a good amount of play in Standard after the rotation and downfall of Cawblade; though Venser may take the reins as the Blue/White Control Deck in the format.